Banana Waffles with Spiced Rum Pecan Syrup are hearty enough for breakfast and indulgent enough for dessert. Bonus that the syrup is excellent on ice cream! 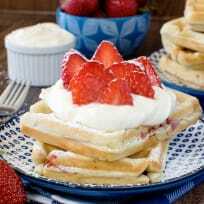 Homemade strawberry waffles are just the thing to make your Saturday awesome. 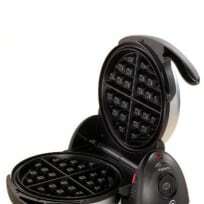 Everyone loves a day that starts with waffles, right? 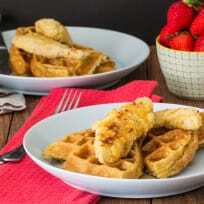 Chicken and waffles are a meal everyone can get behind! Breakfast, lunch, or dinner — your choice! Back to school means back to breakfast, and we've got lots of easy, kid-friendly options for you! 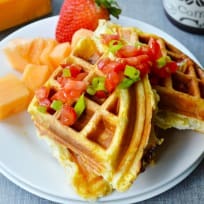 Egg and cheese waffle sandwiches make breakfast totally portable! Made with refrigerated biscuits, they’re so easy to customize any way you crave. Cherry chocolate chip waffles are indulgent breakfast bliss! You’ll swoon over the sweet flavor loaded into every bite. Funfetti waffle put the fun back in breakfast! Rainbow sprinkles makes these waffles extra special. 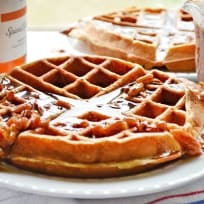 Orange spice waffles are full of warm spices and citrus flavor. They’re easy to make for a cozy winter brunch. 5 Minute Cinnamon Sugar Waffle Bites are so easy, you won’t believe it. You just need four ingredients and five minutes for this silly easy breakfast! This apple butter bacon waffle sandwich is good for just about any meal, from breakfast to brinner. Sweet apple butter, crisp bacon and creamy Fontina cheese make it as delicious as it is unique! Paleo pumpkin waffles make a terrific fall breakfast. They'll make you grateful for cooler temperatures!